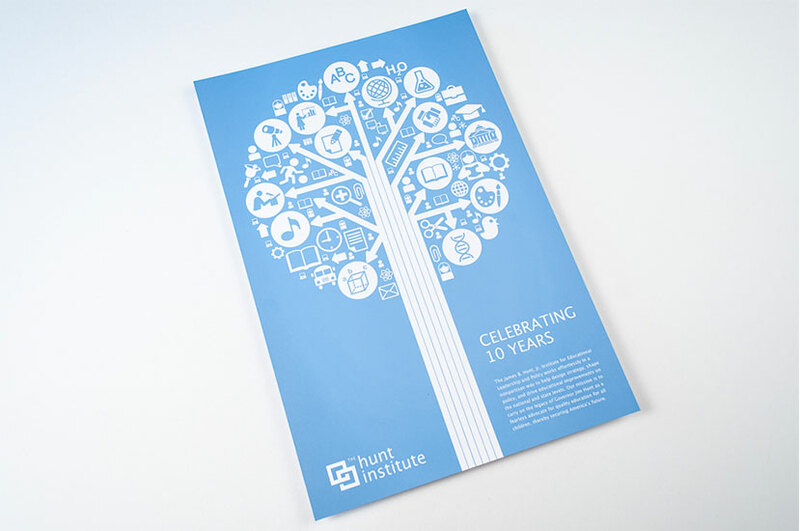 Generate Design created this image of a tree bountiful with iconographic “leaves” on Adobe Illustrator to make the focal point of the Hunt Institute 10 Year Celebration Ad. The Hunt Institute, located in Durham, NC, works to transform the public education system by generating and facilitating dialogue about the system and by mobilizing action to tackle the problems that matter. Therefore, we sought to make this ad symbolize the growth and nurturing nature that the Hunt Institute embodies. By using a tree as our main symbol, we were able to play around with the iconography that made up the leaves, and also make up the Hunt Institute. This print ad for the institutions 10 year celebration is simple, clean and true to the Hunt Institutes core goals.